The U.S. World War One Centennial Commission has recognized the Journalism Department for its work telling Connecticut stories of World War I as part of a collaboration with Connecticut State Library. John Monahan, one of the 12 members of the national World War One Centennial Commission, presented a certificate of recognition to Cindy Simoneau, Journalism Department chair, Assistant Professor Jodie Gil, and a group of students from the Journalism Capstone course, at the Adanti Student Center Saturday, April 14. The students were on campus presenting their World War I project at the fourth-annual Undergraduate Research & Creativity Conference. 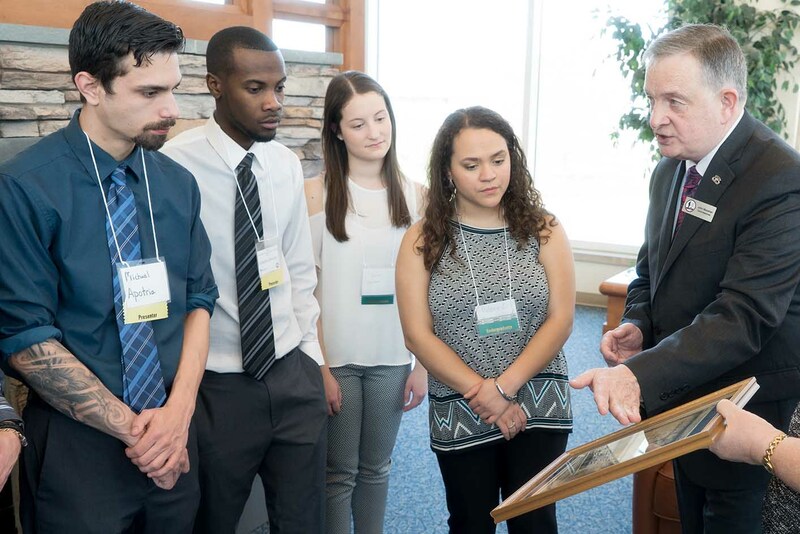 Southern students Michael Apotria, Lynandro Simmons, Chloe Gorman and Melanie Espinal listen as John D. Monahan, member of the U.S. World War One Centennial Commission, describes the artwork on a certificate. 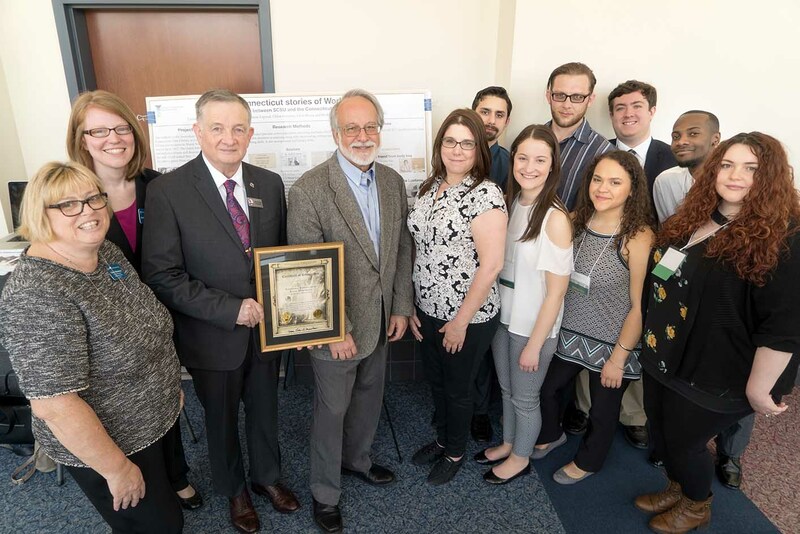 The commission recognized the Journalism Department at Southern Connecticut State University for its work telling stories of Connecticut in World War I during two semesters of Journalism Capstone courses. | Vern Williams photo. The certificate recognizes the work journalism students have done in collaboration with the Connecticut State Library’s Remembering World War I project, which is digitizing World War I artifacts and cataloging Connecticut residents’ stories about their family connections to the war. Monahan said the certificate was specially designed to include World War I era artistic elements. In Fall 2016 and Fall 2017, 20 Journalism Capstone students have researched and reported more than 80 stories and video packages that tell journalistic stories about Connecticut’s role in World War I. The stories will be published on CTinWorldWar1.org, the State Library website that serves as the central clearinghouse for all things World War I. Project manager Christine Pittsley also attended the presentation. Featured image: From left to right: Cindy Simoneau, Journalism Department chair; Jodie Gil, assistant professor of Journalism; John D. Monahan, member of the U.S. World War One Centennial Commission; Robert S. Prezant, provost and vice president for Academic Affairs; Christine Pittsley, project manager for Remembering World War 1; and students Michael Apotria, Chloe Gorman, Brokk Tollefson, Melanie Espinal, Chris Rzasa, Lynandro Simmons and journalism graduate Melissa Nunez | Vern Williams photo.